ARE YOU READY FOR THE BOWL GAMES?!?? ARE YOU READY FOR THE TOP TEAMS IN THE NATION TO BATTLE EACH OTHER IN CRAZY LOCATIONS? Well, you’ll have to wait a few weeks for the GOOD teams, but the barely average teams ones start playing TODAY!! 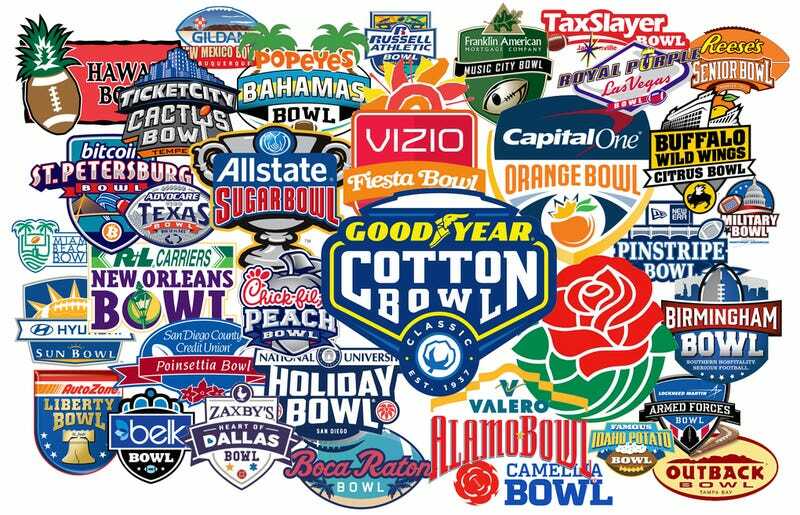 Bowl game season is always a bit depressing for me, as it is the beginning of the end of football season. I don’t do well during non-football season. What am I supposed to watch, basketball? PSH!! But we’ll enjoy the games as best we can. Even the crappy ones. The games start trickling in today, with the New Mexico Bowl and the Las Vegas Bowl featuring at least one good game between them. Does anyone else find it INSANELY ironic that the two most Mormon teams in the nation are playing each other in Las Vegas/Sin City? Do their fans stay in casino hotels, or is that against their religion? I dunno. Here’s a list of the games. Tell me which game you think will the the best of the season!